As part of his solo exhibition in Le Cube- independent art room, Ulrike Weiss presents an unprecedented installation, Chambre de fille. Assembling drawings, screen projections and manipulation of light, this polysemous project invites the spectator to a total immersion. 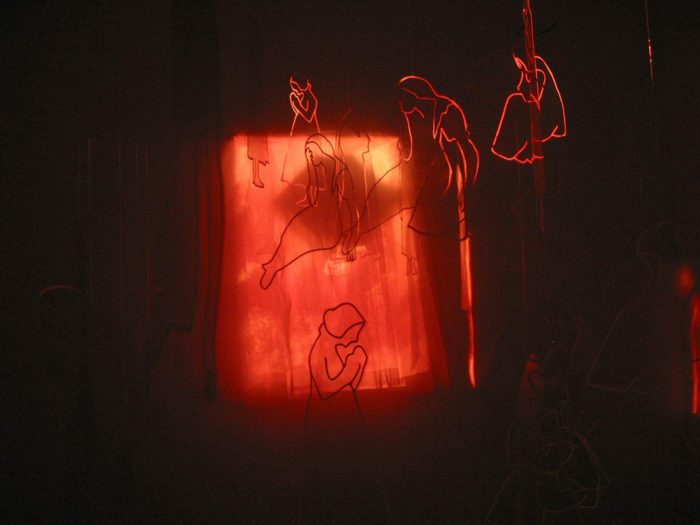 A projection on a set of transparent figurines is at the heart of the installation, representing female characters from the tales of the Brother Grimm, and plunging the main hall into a game of alternative light and shadow. The spectator, who is separated from the girl’s room by a curtain of light tulle, can perceive light reflections on the hidden walls. A blow of wind makes the silhouettes move, the whole space follows the movement in a fairy manner. In another space, Blond venus, a series of eight drawings in Indian ink takes up the theme of virgin girls and their virtue was set. Ulrike Weiss lives and works between Fribourg and Rabat. She teaches at the Ecole des Beaux-Arts in Fribourg, and at the National Institute of Fine Arts in Tetouan.